Mix Preferment about 12 hours before final dough. Bulk ferment for 2 hours, folding ever half hour. Remove from tin as soon as possible, cool on rack completely before slicing. Hope you enjoy this bread as much as I do! I know I haven't posted in a while, so here's a recent loaf. Wish that I had crumb pictures, but the bread was turned into a bread bowl at a party for some spinach onion sour cream dip, and was devoured before proper pictures could be taken. Thanks dmsnyder for the awesome formula, and happy baking everyone! Sometimes you just want a loaf of pan bread. I have been working for a while to nail down a loaf of relatively lean sandwich pan bread, moving through formulas in many a baking book, converting them to sourdough and scaling them for my 4"x8" loaf pan. 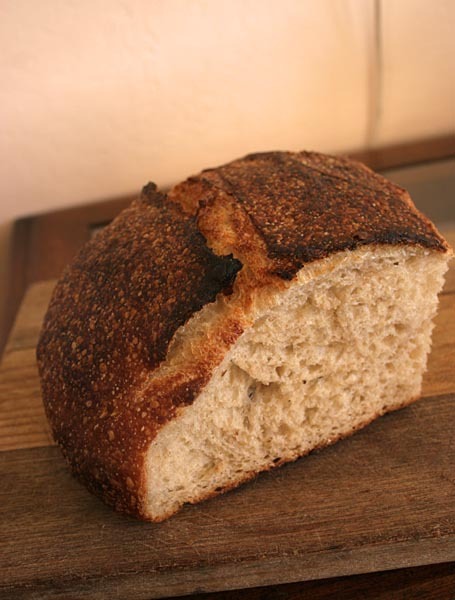 I ended up settling on a highly-tweaked formula based on Peter Reinhart's Vienna Bread from BBA. Recipe is scaled for a 4 inch by 8 inch metal loaf pan. A young levian is used for this bread, a mere 4-6 hours after the preferment has been mixed. This Bread makes excellent sandwiches, toast, and if shaped differently makes great rolls, hotdog/burger buns. Hope you enjoy it as much as I do! I know what you're thinking. "A bagel on the west coast? and in Oakland? never!" But wait, and hear me out here: you can get a decent, nay, great bagel in Oakland. You just need to know where to look. There's been an article here and there about how Oakland is the Brooklyn of the bay area, including a food renaissance leaking over from SF. This may be for many reasons, and in no small part because rents are getting more and more expensive on that side of the bay. Oakland is becoming the hipper, edgier (and sketchier), side of the bay. And suddenly, all at once, a few artisan bagel places popped up, one after another, or sometimes all at the same time. One of these I had the pleasure and honor of working for as a baker. I learned many things, especially as this was my first job in the industry. One of which I posted earlier (the buttermilk muffins), and this time I'll dive right into the meat of the subject: an Oakland Bagel. I should start by saying that the recipe/method that I'm posting today isn't quite what we used in the bakeshop, I have changed the recipe around to better suit the home-baker, as well as converting it all to sourdough (we used yeast along with the stiff sourdough starter in the shop) to suit my own taste. Anywho, in we go, and hope you enjoy. add seeds as desired when bagels are still damp and tacky. Bake in pre-heated 450F oven for 12-15 mins, flipping or rotating as necessary to insure even baking. Tips: Highest gluten flour available to the average consumer is King Arthur's Bread flour, which works very well in this recipe. Careful if using a stand mixer, this dough is very stiff (you may think you did something wrong, you probably didn't), and may stress out your mixer. I know it's been awhile since I have done much on here, things have been crazy, I'm moving homes soon, and switching jobs, it's all been so hectic. This post does relate to bread, I promise, getting there. I recently got a job as one of the bakers at a small bakery that bakes and sells bagels and morning pastries to local cafes. This is my first job in the baking industry and I'm very happy to be working in such a small shop, where I'm looked to for say in recipes and product formulas. The recipe of this post is reflective of my time at the bakery so far: at home, I was never able to duplicate that bakery-style muffin, you know, the type that looks like an overgrown boulte mushroom, with the top bigger than the base, coming to a nice crowned point. Home recipes invariably tell you to quickly combine ingredients, fill tins 2/3 to 3/4 full, then bake as soon as humanly possible. For me this was frustrating, as it always ended up with stumpy muffin with no spill over, looking nothing like a muffin you'd buy in a cafe. The first time I watched muffins being made in the bakery, I had my answers, and so I figure that I would share not only my favorite base muffin recipe, but a few tips on how to make them turn out like the ones you see in cafes. Combine Flour, baking soda/powder and salt into a bowl, sift. Cream butter and sugar in separate large bowl until fluffy. Add eggs to butter/sugar mix and beat until combined. Alternate adding Buttermilk and flour mixture in three stages, continue until there is no flour clumps. The shown muffins used almond as the extract, and included a pinch of mace in the batter. Fruit stir-in was 100g diced peaches. One of the muffins displays a strudel topping. 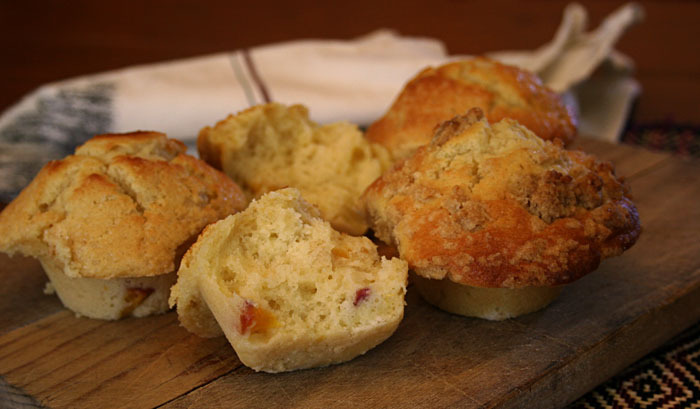 Chilled batter makes shaping the pre-baked muffins easier, and helps them hold shape. We make one batter in the bakeshop, stirring in all fruits/spices as we need them just before baking. Batter keeps in fridge for up to 3 days. I walked into my specialty foods market, and there they were, staring back at me. Sitting next to the key limes and tangelos, the yellow-orange skinned globes begged me to stick a nose in the display. Bergmont orange season, short lived as it is, had arrived. Almost without thinking, I tossed a few into my basket. Bergmont orange zest is the major flavor component in earl grey tea, and as I was enjoying a nice cup of earl grey, inspiration took hold; Earl Grey Sticky Buns! 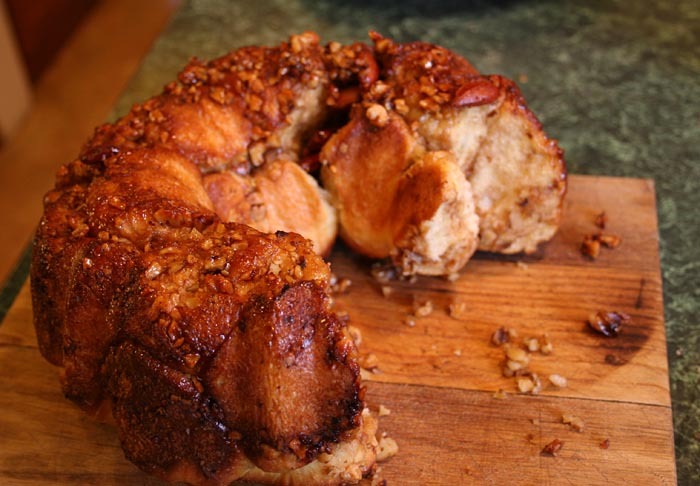 The sweet dough is based on Richard Bertinet's, and the basic idea is based off of "Orange Sticky buns" from an issue of Saveur. The dough is given a cold-retard at least overnight in the fridge to develop flavor, in lieu of a pre-ferment. Mix until shaggy dough is formed. Rest for 20 mins. Kneed until gluten is well formed. Retard overnight (or longer). Roll dough into a large rectangle, spread filling evenly across dough. Roll up dough into cylinder, cut into 12 pieces and place into a buttered baking dish (mine is 9"x12"). Bake untill cooked though at 325F. Frost if desired. I've fiddled around with this recipe quite a bit, finding the right amount of levain and durum to suit my tastes, and here's what I have settled on. The key to the big bubbles and flavor is a minimum 24 hours in the fridge, maximum 3 days. There's lots of instructions on how to make good pizza in a home oven, my setup is as follows: Stone on the bottom of oven (gas in my case), pre-heated at 550F for an hour. Pizza goes in on parchment, when the crust just starts to get toasty looking I put the broiler on until the top bubbles just begin to char. Mix all ingrediants together until a rough dough is formed, let rest for 30 mins. Kneed until smooth, rest on bench for an hour. Divide into two equal pieces, form into balls. Place in fridge for 24-72 hours. Take dough out of fridge at least one hour before baking. Hope it works for others as well as it has worked for me. I know I've been slacking on the posting lately, so here's my pictures post of some recent breads I've done. Changes: replaced all flour for Central Milling's type 70 high extraction flour. Bulk ferment pre-shape instead of post-shape. Baked in a dutch oven. This one turned out quite sour, not quite boudin-sour, but still very nice. Using my house sweet dough, balls of dough are dipped in butter then rolled into chopped walnuts and raw sugar. Baked into a bunt pan covered in butter and sprinkled with sliced almonds. This sweet dough is a mixture of two recipes; The brioche recipe from the Tartine bread book, but with the percentages of butter, eggs, and hydration scaled back to similar percentages as Richard Bertinet's sweet dough (My favorite yeasted basic sweet dough). I use this dough for most of my basic sweet dough pastries, some of my favorites are Monkey Bread, Cinnamon Rolls, Orange/lemon sticky buns, fake croissants (in this case with chocolate), Fruit braids, etc. Details on the starter/poolish: Chad Robertson advocates the use of "young" levian and poolish, with less fermentation time than more "mature" starters, using them right when they float in water. I admit that I use them whenever it works best with my time schedule usually between 6-8 hours. The starter is a 100% hydration, fed with a 50/50 mix of AP flour and whole wheat flour. For people who like Yeast Water, I think this one would translate very well to YW + SD, with YW used instead of poolish (I'm looking at your dabrownman). 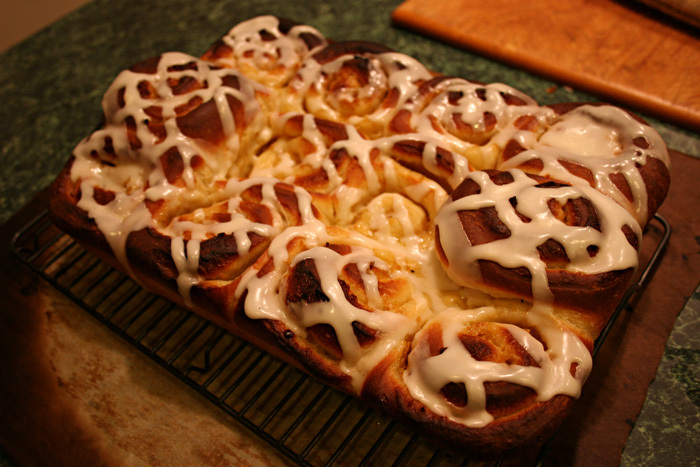 Pictures are of cinnamon rolls and fake chocolate croissants, dough also made an apple/cheese braid which is not pictured. Baked at 375. For part II of my panaderia series, I bring the recipe for just about the most prevelant of pan dulces (sweet breads) in my old neighborhood; Conchas. I've been looking for a good conchas recipe for ages, ever since I could no longer walk down the street to get a batch for 30 cents apiece. This recipe is adapted from a great book (possibly the best one I've found in english) by Diana Kennedy, Regional Cuisines of Mexico. Mix starter, let rest overnight or until doubled. Mix flour, butter and yeast into liquids and let autolysis for 20 mins. 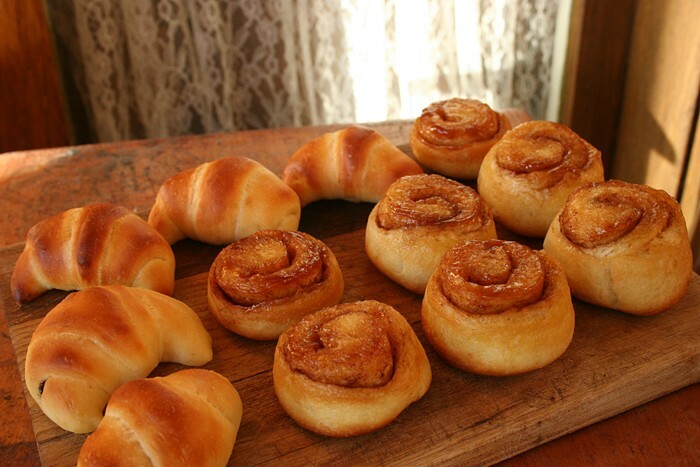 Fold in salt and kneed until dough is satiny. Let dough double in a warm area, folding at least twice during fermentation. Mix topping, incorporate until a dough using the back of a wooden spoon. Divide dough into 16 pieces (about 60g apiece), shape into rounds and place on a silpat or parchment paper. Pull off 1" balls from topping mix, flatten into discs between your palms. Press flattened discs into dough balls, flattening them a bit. Score tops in a shell or grid pattern, cutting half way into the topping, and let double in size. Bake at 350 for 15-17 mins, until conchas turn golden and sound hollow when bottom is tapped. 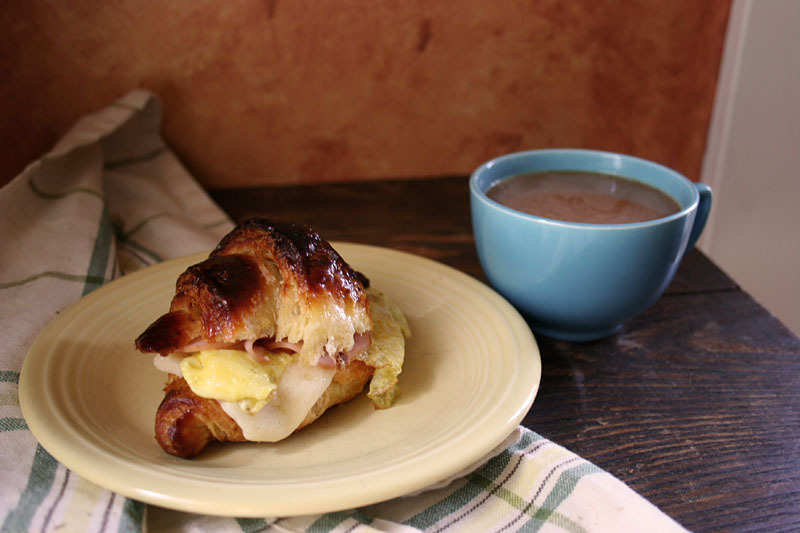 Enjoy with a glass of milk or a nice cup of hot cafe con leche. The shaping takes some practice, but there's a few videos on youtube that can help out. These simple eggy breads are favorites of mine, and I hope they will be of yours too.